Isn’t it strange that when I was looking for Christmas recipes to make ahead, I just chanced upon this irresistible apple recipe that I, for one, was not able to resist. Why, you ask? Because it looks fairly easy to make, and looks exceptionally ‘yummy’, especially when partnered with thick cream or good vanilla ice-cream. Take a look at the picture and tell me that you, too, can’t resist it. 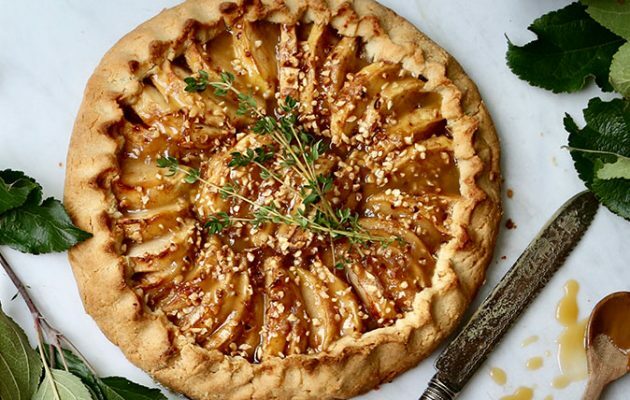 Salted caramel, apple & roasted hazelnut galette – courtesy Country Life. I love the sound of this Salted caramel, apple & roasted-hazelnut galette recipe, and can't wait to eat it. You could probably make it Christmassy by adding a thin layer of mincemeat under the apples. Worth a try. Process together the flour, almonds, sugar, chopped butter and a pinch of salt until the mixture resembles breadcrumbs. Add the egg yolk with a little water and blitz again until it comes together, adding further water if needed. Using your hands, press the pastry into a round disk, wrap in clingfilm and refrigerate for about 30 mins. Melt the butter and sugar together in a pan over a medium heat. Allow the sugar to dissolve, then bring to a boil for a few minutes. Stir the double cream and sea salt through it and set aside. Peel the apples and cut them into neat slices, then toss them in a bowl with the flour, sugar, cinnamon and hazelnuts. Preheat your oven to 180C/350F/gas mark 3 and line a baking sheet with parchment. Roll the pastry out gently into a circle about the thickness of a £1 coin. Arrange the apple slices and nuts into the centre, drizzle with a little caramel and pull the edges up on all sides (see picture above). Bake for 30-35 minutes or until golden. Drizzle with a little more caramel sauce and serve hot with vanilla ice cream, custard or thick cream. Enjoy!! Well, would you believe it, my choice of this irresistible apple recipe is now making me very hungry on this cold Sunday morning. Typing up the words ‘salted caramel’, ‘apples’, ‘drizzle with a little caramel’ at 7.30am, whilst still in my dressing gown and with freezing fingers makes me want to tear up that lovely picture above and eat it ravenously! But no – as a supposedly sensible adult I shall go and wake Erik (again), have a shower and get on with my preparations for Christmas. With 9 people staying a few nights and round our table on Christmas Day, I have quite a bit of tidying up to do in our house, and although I’m hopefully getting better, I still have a right arm that isn’t quite working properly, so polishing and ironing are not my favourite tasks at the moment. But searching out new recipes (including this irresistible apple recipe) is a chance for a good sit-down at my computer. So look out for lots of ‘get-ahead’ tips and more Christmas recipes coming soon. The Best Designed Cookbooks in the World? All my”Prepare ahead for Christmas Food Tips” – coming Next Week. Too Early for Christmas Recipes? What a scrummy yummy dish. I’ll be cajoling and squeezing every last ounce of goodness out of my apples this autumn. Ice cream is always a problem in our house, my husband tends to make it disappear far too quickly. I’m hungry now too Astrid. I’ll instruct cook to make this dish later this week. We have crates of apples in store this year. Lucky you Sister Prudence – what are you doing with the rest of your apples? Hope you enjoy the Galette. regards Astrid. Hi Fanny, don’t be too harsh with your apples – you will need their texture and flavour. But do be careful if using hazelnuts – I remember you had a strange attack some time ago, and we weren’t sure if it was the nuts or the drink! Regards Astrid. Yes, add me to your mailing list so I don't miss any posts! Hi there. We really hope you've enjoyed your visit. If you'd like to keep in touch, fill in your details, trust us with your details and we'll keep you up to date with our adventures. We are Astrid and Erik, a couple who love living in East Yorkshire, Northern England. In the years we have been together we have shared a passion for food adventures. From simple home-spun recipes and the street food of obscure destinations to the haute cuisine of Michelin-starred dining. In this blog we want to share those adventures. We hope you will join usand share our enjoyment. Astrid on Can you use Strong White Bread Flour for Yorkshire Puddings? Serina on Can you use Strong White Bread Flour for Yorkshire Puddings? Astrid on The Best Designed Cookbooks in the World? Mel Stanford on The Best Designed Cookbooks in the World? Astrid on Too Early for Christmas Recipes? © 2019 www.sharingourfoodadventures.com. All Rights Reserved.